Aluminum is a lightweight and versatile metal that has been incorporated for security purposes in many residential and commercial properties. From pool barricades to aluminum driveway gates and fencing increase home safety with quality and professional design solutions. Understanding the features offered with such creations will encourage a flexible, functional and appealing construction that lasts. Aluminum is a popular choice of material in the production of fences and secure barriers because of its exceptional properties. For homes looking to improve its safety and security, the installation of a durable yet simple to maintain fence can provide lasting value. Whether an aluminum fence is used to secure a pool, as a driveway gate or a security fence for a perimeter, it provides a neat and aesthetic appeal. While it does not offer a great deal of privacy, these constructions can transform the appearance of any house from outdated and unkept to modern and well organized. Security has become a major concern for many homeowners. With intruders constantly looking for ways to gain ease of access, improving safety with durable fencing can help protect you and your loved ones. Grade aluminum fences are the best options to secure your property. Aluminum driveway gates are constructed to last and include automated function owing to the lighter weight of this metal compared to steel and wrought iron. Not only is electronic operation easy and efficient, but safer. Rather than get out of your car late at night to unlock your gate, automated features help you open the fence without having to climb out of your vehicle. It provides greater control for the home including access control for improved safety measure. Incorporating these types of electronic solutions can assist in delivering an exceptional and reliable result against would be intruders. Automated fences can swing open provided there are no obstructions or slide along a track. Manually operated driveway gates are slid open and closed. The flexibility of this material makes it easy to operate on a lock and slide mechanism, but automated functionality is best for higher levels of security. To enhance the safety of your home, connect a sensor to the entry gate. It will prevent breaking of locks to gain entrance and makes it easier to manage accessibility. The aluminum fence is a highly durable construction. Adding sturdy fencing as a perimeter around the front of your house can deter would be criminals. The exceptional strength of this metal combined with spikes and decorative spokes on the top line can help prevent intruders from making their way onto your property. While aluminum fencing costs more than regular wood, it will not tarnish and does not require maintenance. Security fences are designed with an above average height or the addition of spokes and pickets. These features aim to safeguard your home and provide residential owners with peace of mind that they have made the right security investment decision. The wide range of designs, colors and construction to select, makes such enhancements an invaluable choice for any property. Aluminum fences that are installed around swimming pools or landscaping give home owners that genuine feeling of a home. 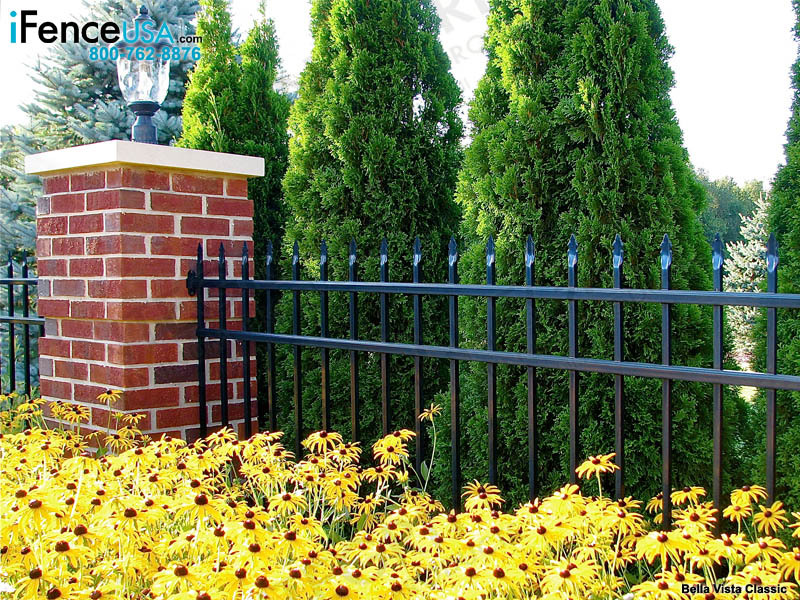 An aluminum fence is a made out of components of aluminum. 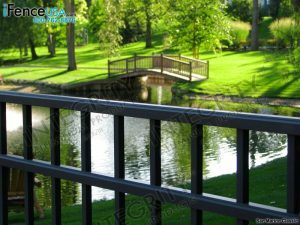 Aluminum fencing turned into a well known fence choice for many reasons including its capacity to oppose erosion, it is lightweight, and offers a number of railing structure options. When aluminum fence is used as pool fencing or perimeter fencing it offers homeowners safety and security while raising the value estimation of your home when you want to sell it. It’s an awesome investment that can give you true serenity and it can endure for up to twenty years. Before you shop for an aluminum fencing system, you need to be aware of the various ways in which aluminum fencing can be used. Below you will find a number of ways in which aluminum fences can be used. Security Fencing: This is a fancy and broadly used aluminum fence with squeezed spear tops for maximum security. It is exceptionally well known style accessible from four national producers and in comes in five colors. It has 6 foot wide boards. Industrial Fencing: Industrial grade fencing offers a heavier grade option in modern aluminum fencing that is very durable. They are mostly used to build security spots in industrial processing plants, and furthermore, in universities and colleges. Pool Fencing: Many aluminum fence manufacturers offer an aluminum pool fence style that is B.O.C.A compliant and accessible. There are a number of decorative options to choose when purchasing aluminum fencing even when being used to enclose a pool. Security Fencing: This high quality aluminum fence planned and designed with a raised spear top can be utilized for security or most broad fence applications. 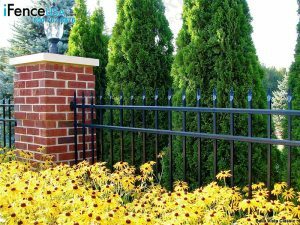 Residential Fencing: This style of fencing can be utilized as a part of a wide assortment of residential/private applications. Residential aluminum fences are most regularly used to characterize property lines, keep youngsters or pets safe, or to encase a swimming pool. Commercial Fencing: Commercial grade fencing is heavier and tougher than the private grade fence. It is perfect for ranges where the quality of a commercial/business item is required in a neighbor-accommodating appearance. These styles of fence are most generally utilized for schools, churches and in public swimming pools. Enjoy any of these options in aluminum fencing for maximum security for your home or business.